Spinal fractures can cause some serious complication as well as discomfort to the patient. These fractures are of different types and that is why requiring different treatment options depending upon the condition that a patient is suffering from. Let us take a look at the various type of spinal fractures that a person can suffer from. These fractures are the most common type of spinal fractures and they usually take place from a fall that a patient sustains. This fracture can easily be diagnosed with the help of an X-ray. Doctors usually go for conservative treatment methods like physical therapy as well bed rest to treat compression fractures. Burst fractures can cause some serious problems as they are termed unstable which means that a person suffering from this type of fracture requires immediate medical attention and stabilization of the body. This fracture leads to the failure of both anterior and middle columns of the vertebrae which is caused by violent compressive load. This fracture occurs in the T1 and T2 levels of the spine. This fracture can lead to lose of vertebral height. Usually this fracture is considered stable as long as the middle and posterior columns are intact. The most common cause of this fracture is usually seat belts in the car and that is why it is also known as chance fracture. 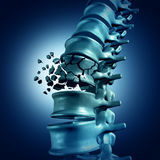 This fracture can cause to the complete failure of the three columns of the vertebral body that leads to injuries to the bone, discs as well as ligaments. Flexion/distraction fracture is considered unstable and therefore requires immediate medical attention as well as stabilization. These fractures can take place in multiple parts of the vertebral body like the lateral margins while the disc and ligament structures gets effected by the torsional and translational forces. Usually doctors go for conservative treatment methods like physical therapy, massage therapy, exercise programs, chiropractic manipulation as well as back braces for spinal fractures and usually back pain surgery is only considered as an option when conservative treatment methods fail to provide any relief or improvement in the condition of the patient.